Are you ready for a quilt-along? Is Quiltalong one word or two? I guess it depends on if you are using a hashtag or not, right? Other than in the social media world, I believe quilt-along should be 2 words or at least hyphened, since you need more than one person to quilt along with you. You will need the February issue on newstands, December 3rd. have some of that laying around! Here is my quilt that I am so PROUD of. This is one of my favorite quilts for many reasons. 2. It uses a bunch of different moda designers’ fabrics. 3. It was inspired by a new friend’s antique quilt. 4. It makes me happy just to look at it. 5. I am going to have a few friends, old and new making this quilt right along with me thanks to the team at American Patchwork and Quilting. 6. I got out of my box and tried something new. Anne Sutton of Bunny Hill. Carrie Nelson of Miss Rosie’s. Lisa Bongean of Primitive Gatherings. Kimberly Jolly of the Jolly Jabber. Amy Ellis of Amy’s Creative Side. side note: Amy is a new designer with……Moda! Yes, you heard it here. Jane Davidson of Want it, Need it, Quilt? about how I got out of my box and tried something new. 7. I would be thrilled if you decided to quilt-long with us. Friday’s video of the week. I just love this design Lissa. Absolutly stunning. It will be such an amazing QAL. And so fun about Amy, Can't wait to see what she is cooking up!!! Do you have to "hashtag" to play along or will owning the magazine & reading blogs be enough? I've been avoiding it, but I guess I will have to join in on this hash tag deal. :-) This looks like a lot of fun. Thanks! Can't wait to get my copy and quilt along with you and the rest. 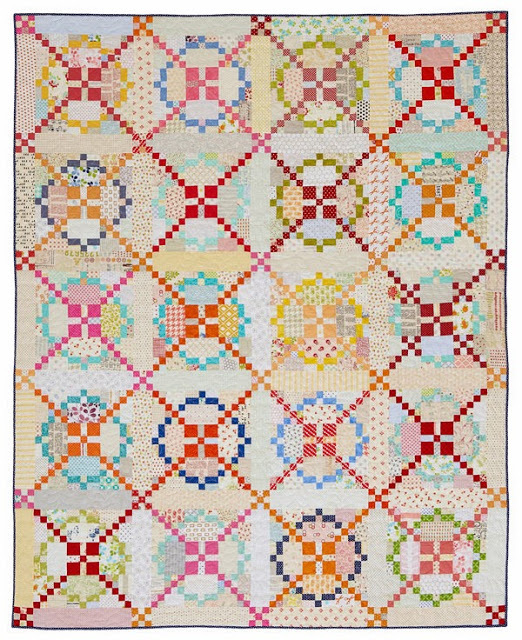 I love a vintage quilt with a modern twist. Thanks for the chance to join in. I love your colorful version. This looks like fun. Guess I have a week to start considering which fabrics to use. And I love your perfect descriptions of the designers – if we know them at all, we know you hit the nail right on the head! Join in to make the quilt. You do not have to hashtag a single thing. 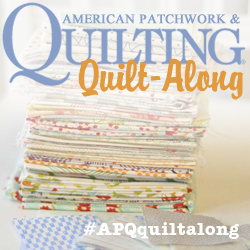 you only need #APQquiltlong if you want to search for anyone posting about this project. Oh count me in! I am in LOVE with this quilt! Beautiful design and I LOVE your scrappy version. And Natalia is amazing. She's done a few quilts for me lately too. She never disappoints! Congrats on a great pattern! 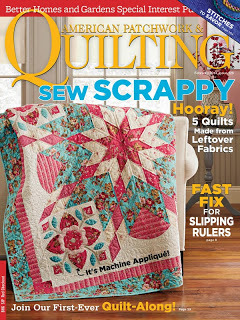 I think your quilt is fabulous and my wip list hasn't reached 99 yet…..and I have no idea what this hashtag is all about so I'm quilting along……look forward to getting my magazine. Great quilt! Count me in! this quilt has been on my 'wanna make' list forever, so of course i'm onboard! 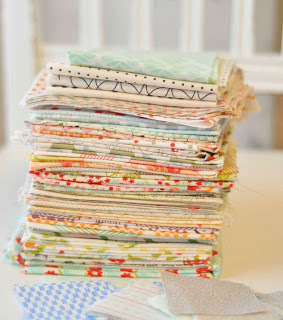 I love the updated version, and that it's so colorful, so scrappy, and has loads of those wonderful little dots, and has lots of Spring shabby fabrics all thru the quilt. I'm definitely in need of some 'Spring" in my quilting, so this comes along at a perfect time for me. THANK YOU! I can't pass up this one! It's beautiful! I am in for sure!!! Love that Amy Ellis is now a MODA designer. Yippee! I love the Burgoyne Surround. I will look for the magazine and see if I have enough scraps to join in! Can you give a hint of the required yardage?